When structuring a sukuk issuance, the first step is often to analyse what exactly the business of an originator entails and what assets (if any) are available to support the issuance of sukuk. If at the outset, it is not possible to identify a specific tangible asset for investment, the sukuk al-mudaraba (or a sukuk al-musharaka) may be a viable alternative to the sukuk al-ijara structure. In the Islamic finance industry, the term mudaraba is broadly understood to refer to a form of equity-based partnership arrangement whereby one partner provides capital (the Rab al-Maal) and the other provides managerial skills (the Mudarib). IIG Funding Limited, US$200 million issued in July 2007 and listed on NASDAQ Dubai. The Investors subscribe for sukuk and pay the proceeds to Issuer SPV (the “Principal Amount”). Issuer SPV declares a trust over the proceeds (and any assets or Mudaraba interests acquired using the proceeds) and thereby acts as Trustee on behalf of the Investors. Issuer SPV and Originator enter into a Mudaraba Agreement with Originator as Mudarib and Issuer SPV as Rab al- Maal, under which Issuer SPV agrees to contribute the Principal Amount for the purpose of a Shari’a compliant Mudaraba enterprise. Originator, as Mudarib under the Mudaraba Agreement, agrees to contribute its expertise and management skills to the Shari’a compliant Mudaraba enterprise, with responsibility for managing the Rab al-Maal’s cash contribution in accordance with specified investment parameters. 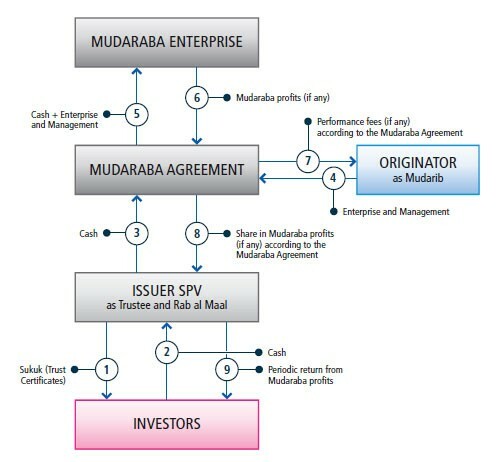 Issuer SPV and Originator enter into the Mudaraba enterprise with the purpose of generating profit on the Principal Amount. In addition to its profit share, Originator (as Mudarib) may be entitled to a performance fee for providing its expertise and management skills if the profit generated by the Mudaraba enterprise exceeds a benchmarked return. This performance fee (if any) would be calculated at the end of the Mudaraba term and upon liquidation of the Mudaraba. On maturity of the sukuk al-mudaraba, the Mudaraba enterprise would be dissolved in accordance with the terms of the Mudaraba Agreement and the Trustee would exercise a purchase undertaking to call on Originator to buy the Mudaraba interests from the Trustee at market value so that the proceeds can be used to service the outstanding amounts due to the Investors. The Investors would be entitled to a return comprising their pro rata share of the market value of the liquidated Mudaraba capital and the profit generated by the Mudaraba enterprise and accrued during the term of the sukuk issuance. Upon maturity, the assets of the Mudaraba enterprise would be liquidated and the proceeds would be applied: firstly, in the return of the capital initially contributed by Issuer SPV; and secondly, in the distribution of any remaining dissolution returns between Issuer SPV and Originator in accordance with the same profit sharing ratios. Issuer SPV (as Trustee) then pays such dissolution returns to the Investors redeeming the sukuk certificates. Mudaraba Agreement Originator (as Mudarib) and Trustee (as Rab al-Maal) Sets out the terms of the Mudaraba enterprise under which the Trustee shall invest the Principal Amount and prescribes the profit sharing ratios between the parties. Purchase Undertaking (Wa’d) Granted by Originator (as Obligor) in favour of Trustee Allows Originator to buy the Mudaraba interests from Trustee for an exercise price which is equal to the market value of such interests on the exercise date if an event of default with respect to the Originator occurs during the term of the Mudaraba enterprise or on the date of the dissolution of the Mudaraba enterprise so that Trustee may apply the proceeds to pay Investors.